Team spirit at Easternpak is strong both on and off the cricket field. Three exciting weeks of a knock-out championship. Twenty four teams in the running. One winner. The cricket team of Easternpak Ltd., corrugated carton plant in Dammam, has once more demonstrated outstanding performance. 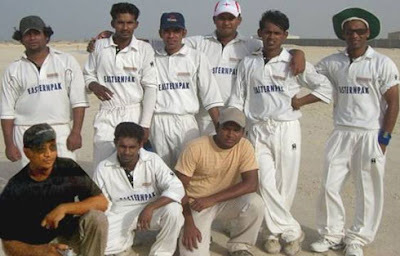 On 20 July, the team captured the winner’s cup of the 2007 Al-Huwai Eight-a-Side Summer Cricket Tournament. Pierre Akl, General Manager, explains, “This demonstrates the strong team spirit we are enjoying” in Easternpak’s work environment. In April 2007, the team also placed second in the Eastern Province six-a-side cricket tournament. DCA organized the latest championship, while Al-Huwais Trading sponsored the event. Congratulations to the Easternpak team! Established in 1994, Easternpak Ltd. is a manufacturer of recyclable corrugated packaging solutions and the only HACCP-certified corrugated manufacturer in the GCC and Middle East North Africa (MENA) regions. Mother company, INDEVCO Group, is the sole licensee in the Middle East of OTOR packaging systems. Easternpak offers a range of pre-print rolls, corrugated boxes and containers, and POP displays, all produced from biodegradable raw materials.